The job of the user researcher bears more than a passing resemblance to the job of an investigative journalist. Both are looking for buried treasure — stories that capture a particular individual’s goals, motivations and struggles while simultaneously resonating with a much larger audience. Both are trying to find the truth behind what people say when the truth is hidden in a Rashomon-like web of contradictory narratives from different people. And both are dealing with unreliable witnesses: people who do not understand why they are doing the things they are doing, or don’t want to tell you, or don’t tell you the whole truth. But many design teams continue to approach user research naively: for example, they ask people what they want (and believe the answers). Or they approach research projects with a hidden agenda: they cherry pick the findings and tell senior management what they want to hear. Or they allow just one person to become the repository of user research knowledge and fail to build a user-centred culture. 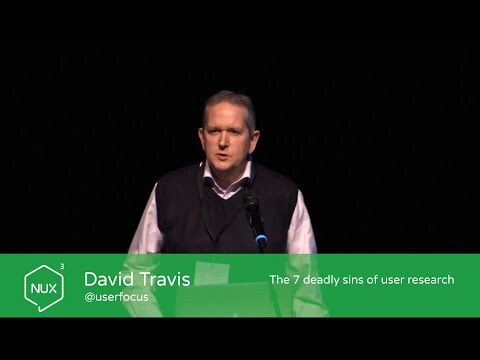 In this presentation, I’ll talk about these and other common sins of user research. I’ve seen these mistakes in start-ups and established firms; in both public and private sector organisations; and in teams using waterfall and agile development methods. I’ll also make some suggestions on how you can avoid these problems on your own projects. Extra: You might want to check out David’s slides and the multiple sketchnotes done at his talk.